An attractive, very low-growing groundcover with rounded, blue-grey leaves. In late summer, pink flowers are produced which age to carmine-red. 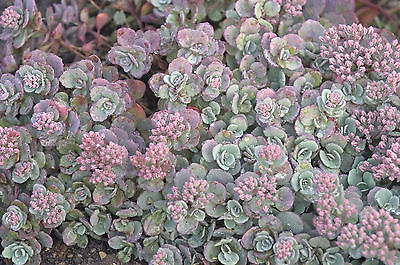 This is the perfect sedum to tuck into a rockery or other small spaces in the garden. Low, spreading sedum form a solid mat of foliage which is excellent for covering slopes or can be planted as a groundcover in sunny, dry areas. They are extremely drought tolerant and many are evergreen. These are terrific low-maintenance plants that always look their best. Tough and easy to grow, it loves a hot sunny location. PURCHASES IN OFF SEASON WILL BE DELIVERED FOLLOWING JUNE. CANNOT SHIP TO ANY STATE IN USA WITH ZIP CODE BEGINNING WITH "3"